The last morning of camp I wake up early. The light is up enough to start taking pictures, and I’m overjoyed because I’m parked in the middle of what looks like a thimbleberry forest. 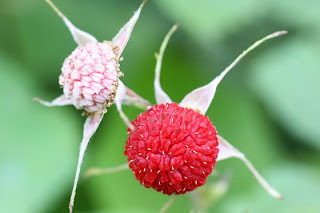 I thought the thimbleberries were gone for the year, judging by the ones I’d seen earlier along the river, but in the mountains they’re in full swing. I cheerfully pick and take pictures for a couple hours. Little thimbleberries are delicate and don’t last long, so of course I have to eat a good deal as I go. The rest will go into the icebox until I can figure out what to do with them. Happy with my haul I head back to Otto the Travel Box, make a quick breakfast, grab my book, and carry everything out to the campsite picnic table. 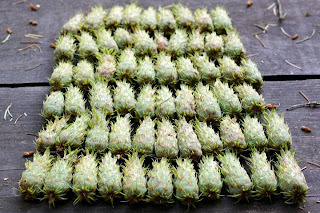 I take a couple bites, begin to read about wild food in Idaho, and strangely an immature pinecone lands beside my plate. This happens again, and again, and pinecones start to rain down faster and harder. Angry chattering begins to accompany the barrage of pinecones, and a little territorial grey squirrel shows himself just long enough to scold me. He then races from branch to branch pummeling me with these spiky weapons. A territorial war has been declared. I start to chatter back, which makes him so angry he races faster to gather and chuck pinecones at my head. I try to take a bite of my food, and wham! another pinecone hits my plate! Pine needles are everywhere, and my food looks like a forest floor. I chatter back and yell at him to stop, this simply eggs him on. I start throwing his pine cones back, but my aim is so bad he gets even more fired up. Finally, I wave a proverbial white flag and run for the motor home. So much for breakfast outside! At this point I start to laugh, I laugh so hard I can’t breathe, and I’m sure the other campers must think I’m crazy by now. The grey squirrel on the other hand gives me a look of loathing, and marches off to see what damage I’ve done to his picnic area. Once he leaves, I quickly collect the pinecone bombs for a quick count and picture. Sixty-one pinecones chucked at my person. This is one squirrel not to be messed with. I pack up and head out soon after; much to the relief of the enemy I’m certain. 2 large eggs (Reserve 2 tablespoons of the beaten eggs) and add to mixture. Flour surface, dump out the dough, flour top of dough. Kneed a few times and press pieces of dough into scone pan or scoop out with an ice cream scoop and drop onto a cookie sheet. Brush with reserved egg and sprinkle with sugar (I used coarse sugar). Bake for about 15 minutes. 1. I do all this in a food processor. If you want to do this, add the ingredients in the order of the above directions and be careful not to over-process. 2. 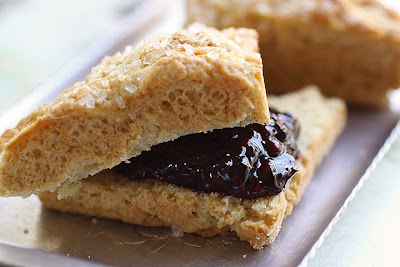 If you use a mini scone pan leave 5 spaces empty and bake for 12-13 minutes. Scone recipe from "The Joy of Cooking", pictures by Laura Flowers. What a wonderful story. A You-Tube moment! Lol no kidding. I wish I could have gotten it on video. What a hillarious story! I am glad you are ok! Lol yeah I somehow survived that one. I can still picture him in my mind all puffed up and angry looking at Otto. Oh my gosh...that is hilarious!!! What I wouldn't give to have seen it in action :D Your scones look great. Oh my goodness... this is such a funny story! What a little character you had to deal with. I love the photo of the "spiky weapons" ;).